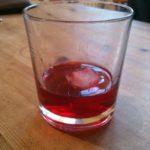 My sloe journey started on an early Autumn day when I was full of enthusiasm for making sloe gin. After rambling through the hedgerows, dodging a few rabbit holes and being careful of the thorns I had a basket rammed with sloes. I had romantic visions of sloe picking scenes but in reality it was pretty hard work. Was it worth it? Absolutely. First of all the sloes were steeped in gin. This particular batch included some blackberries which have to be removed after three months to stop them turning bitter. At this point I had a litre of glorious hedgerow gin and some plump, gin filled sloes that couldn’t be simply thrown away. They were made into sloe port. The sloe bushes are now in full, sweet smelling blossom and my port is ready. If you are out and about and spot a blossoming sloe bush, make a mental note to remember its location ready for picking come Autumn. So now I have a Rumtopf full of sloes swimming in ruby red port. The port is fantastic; a more rounded version of the sloe gin. You get the flavour of sloes, the warmth of the alcohol and the richness of red wine. There’s nothing else quite like it. I can’t wait to have some with cheese, add it to gravy for richness and put a little in a hip flask for a calm evening walk. My sloes and I have been on a magnificent adventure thus far but where can I go from here? I have a few ideas up my sleeve to ensure that the sloes are used to their full potential. Out of 2kg of sloes I have produced 3l of elixir and I don’t intend to stop there. 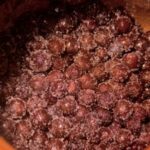 To see how to use the sloes from your port to make chocolate truffles, the recipe is here. Don’t tease! What are your other ideas for sloe use? I remember walking in the country last autumn and being astonished and also dejected by all the hedges dripping with millions of sloes. Such a huge harvest! And yet (to my knowledge) only one very limited thing to do with ’em. A new fragrance called “Eau de Sloe”?? Exciting! I’m going to have the first taste of my sloe gin soon. I think we both made ours around the same time – October/November ish – can’t wait to try! Excellent – I’m really pleased that this worked out. I’ve really got to try this. First, I’ve got to work through my sloe gin backlog in time for the next crop – I’m just not drinking enough. I often add sloe gin to homemade jams – I wonder if the port would work in the same way? Sounds amazing. I really love sloe gin, a friend I used to work with always made it and we would purchase bottles from her. This year I bought a bottle from a shop and it was a pale imitation. 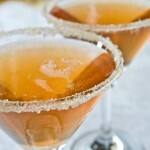 I don’t know about sloes but it sure added knowledge to me and suppose I am discovering new recipes via blogging. Of course, a glass or two of alcohol is what I do esp during weekends. Just about to decant mine and add a little brandy…… looking forward to the taste test. By the way, does it still count if I bought my sloe’s off the internet, they were picked by Hadrians Wall!! this is so cool! i’d love to try some! Wow, I had no idea you could make your own–that port has a gorgeous color! Well done on your gin. It must be very rewarding to produce something so delicious from scratch! Wow, I haven’t seed sloe in so many years! Well done! Gosh, this does sound incredible. Sloe port with cheese? Wow. Somebody offered us a bottle of sloe gin a couple of years ago and we haven’t even tried it yet. Don’t even know what to do with it. Well, yes, drink it but on it’s own or with a schweppes? I’m a bit sloe on anything other than wine! Yes, it is hard work and the blackthorn bushes have very sharp spikes. Sloe Port sounds a great idea!